With a hospitable and courteous staff always at your service. 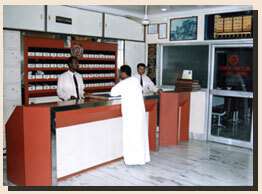 You can be assured of a pleasent and memorable stay. Round O'Clock room service at your door. AC Dining Hall on the first floor serving Veg, Non-Veg, Moghlai, Punjabi Dishes.